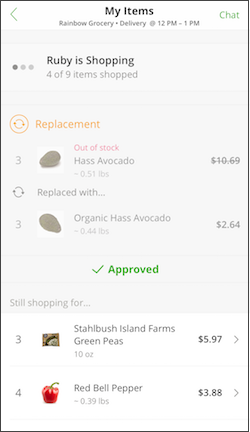 During the shop, tap See Shopped Items to track the shopper's progress and view item changes. 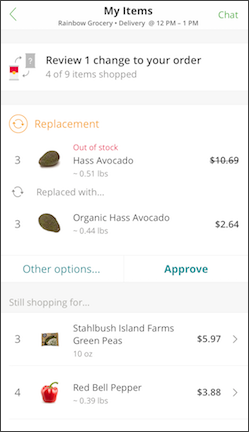 Use this feature to add new items to the order as needed. On this page you'll see the reason the item was replaced or refunded. You can select other options for replacements, or choose a refund for the item instead. 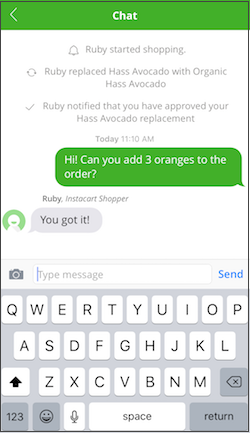 If you don't see the option you'd prefer, you're welcome to chat with your shopper directly by tapping the Chat with button. If you approve the change, the shopper will be notified to proceed. Please note: depending on your store and delivery time, your order may be stored at temperature until it can be picked up for delivery. If so, you will see information about this in the order screen. 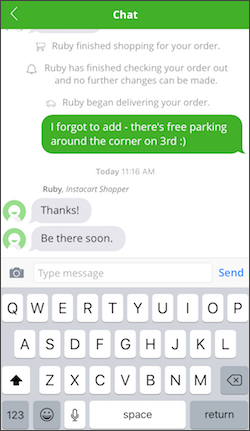 If you have in-app notifications turned on, you will receive a notification when your shopper replies. 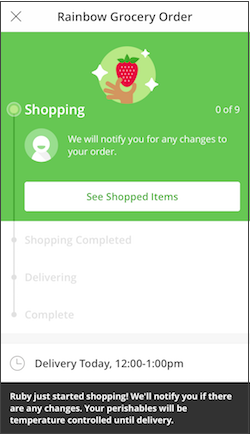 Please note: If your order hasn’t been connected to a shopper yet, you can manage your items, notes, and replacement options in your account. Click here for help updating your order items. Here you'll see the delivery ETA. Tapping Map on the order screen displays your driver's location. After your delivery is complete, you can share your order rating to let us know how it went. Ratings apply to both the shopping and delivery of your order. We may also occasionally ask about specific parts of your order. You can give general feedback and report specific item issues. For more help viewing your receipt, click here. If you’ve already submitted an order rating, you can click here to contact Community Support regarding the issue. We’ll reply ASAP. Shoppers appreciate tips as a way of recognizing excellent service and 100% of your tip goes directly to the shopper delivering your order. By default a 5% tip is suggested at checkout, with a minimum suggestion of $2 per individual store delivery. Tips are optional and the default tip may be adjusted at checkout or when rating an order after a delivery. You can add and change a tip amount up to 3 days after your delivery is complete. Your receipt will update accordingly. Where do I modify the tip? 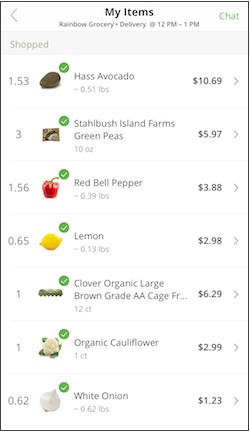 To adjust the tip when placing your order, tap Change next to Driver Tip at Checkout. Select a tip amount and tap Save. You can adjust the tip after your delivery is complete through the receipt pop-up in your app, in your account, or via the emailed receipt statement. Clicking rate order will take you to the tip page. You can adjust your tip within 3 days of your completed order. Follow the steps to access the Order page, above. Select View rating and adjust the tip as preferred. The service fee is not a tip and does not go directly to the shopper delivering your order. For more information about the service fee, follow this link. At this time, except in situations where a Shopper must return alcohol to the store (for example, if the Shopper cannot confirm valid ID), Shoppers cannot accept items for return. If you choose to make a return in-store, please note that in-store returns are subject to in-store policies, and vary by retailer. 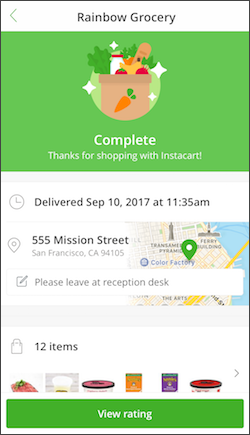 Some retailers may accept your digital Instacart receipt as proof of payment. 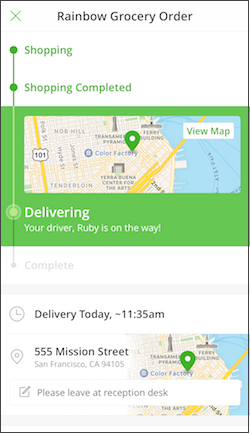 When your order is ready for pickup, we'll send you an SMS or app push notification on your phone along with pickup instructions. When you arrive at the store, follow the instructions we've sent you to let us know you've parked. Some stores offer dedicated parking areas (we'll let you know if these are available when we send you pickup instructions). Depending on the store, you'll either pick up your order inside or wait while we bring your order out to your car. Your order will be ready to pick up at the time you requested when you placed your order. Please follow the Pickup instructions you received. For orders with alcohol, you’ll need to bring a valid form of ID. For all orders, remember to bring your phone to get notifications about your order. Where do I park to pick up my order? Most stores will have dedicated parking spots for you to wait in while we bring your order out. But we’ll always provide store-specific instructions for your order before you arrive. Do I go inside the store to pick up my order? For most stores, there's no need. We'll have someone bring the order out to your car! At some select locations, you may need to pick up your order inside. What items are available for pick up? Any items that are available for delivery are also available for pickup.